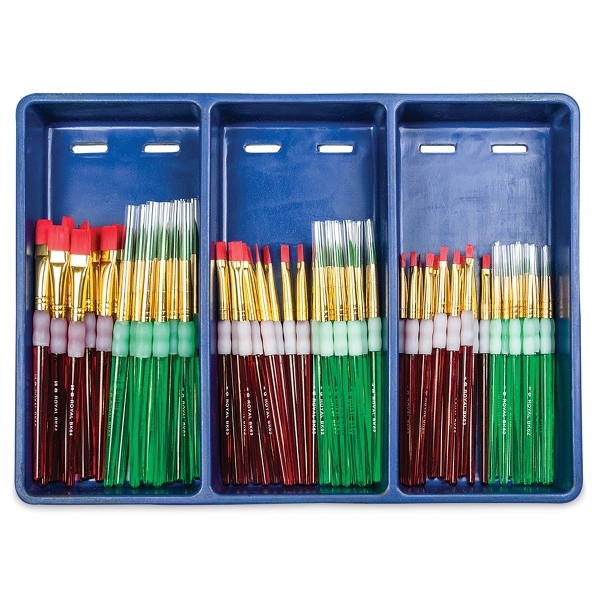 These durable Taklon brushes from Royal Langnickel stand up to repetitive use. Royal’s Grippers technology gives kids extra gripping power and more control while they work. 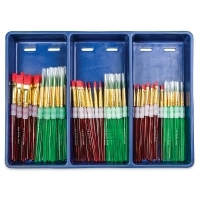 Kids also love the brightly colored handles, a fun departure from traditional paintbrushes. Each Class Pack contains 12 small bib aprons. 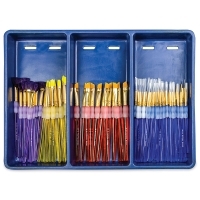 Every class pack includes a divided plastic tray with drain holes in the bottom for drying the brushes flat. The tray doubles as a storage tray. Taklon Specialty, Set of 72 — This set includes 12 each of Fan Size 2/0, Liner Size 10/0, Detail Size 10/0 and 1, Angular Size 3/8", and Filbert Size 6, plus 12 small bib aprons. Taklon Assorted, Set of 72 — This set includes 12 each of Round Size 2, 6, and 10, Shader Size 4, 8, and 5/8", plus 12 small bib aprons. 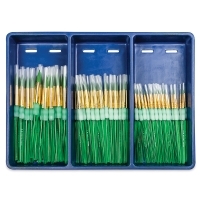 Taklon Round, Set of 72 — This set includes 24 each of Round Size 2, 6, and 10, plus 12 small bib aprons.